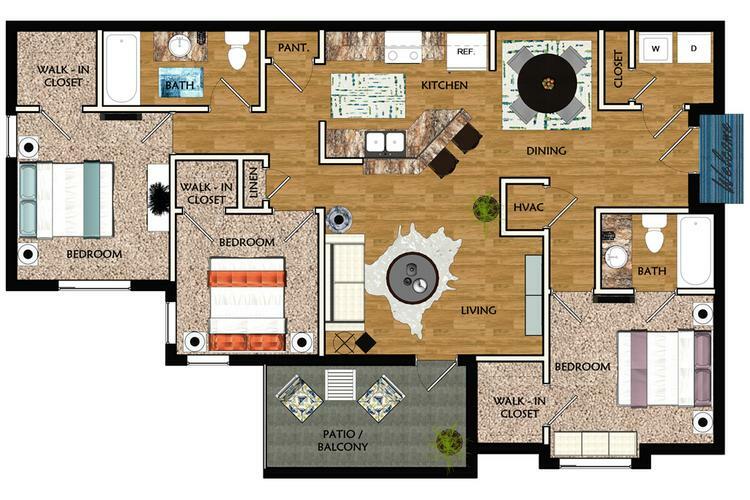 The Ryan, with almost 1,400 square feet of living space, surpasses expectations! You’ll fall in love with our newly renovated kitchen with stainless steel appliances, custom backsplash, and black fusion counter tops. Not to mention, there are brushed nickel lighting and plumbing features throughout to add the perfect modern touch. You’ve only dreamed of the closet space available in our 3 bedroom apartment. The spacious laundry room, with included washer and dryer, features additional storage space. A French style doorway opens to your very own private balcony great for relaxing or entertaining in this open floor plan. Come experience a new level of living!